Since the first vintage of Black Hills Nota Bene in 1999, the anchor of the blend has almost always been Cabernet Sauvignon. That speaks volumes for quality of that varietal from this site. The vines were first planted in this Black Sage vineyard in 1996. Cabernet Sauvignon generally ripens a few days later that either Merlot or Cabernet Franc, the two other Bordeaux grapes in the Nota Bene blend. However, if the grapes are grown carefully, as they are at Black Hills, Cabernet Sauvignon yields ripe flavours, along the structure that makes Nota Bene age-worthy. The 2014 vintage one of the best red wine vintages ever in the Okanagan. Assistant winemaker Tamara Feist suggested to Graham Pierce, the winemaker, that Black Hills should release, for the first time, a single varietal Cabernet Sauvignon. So a choice lot of Cabernet Sauvignon was selected. It went into a new French oak barrel for two years. It was then bottled and aged another year in bottle before release. There are obviously not many bottles of this wine: just 23 cases, priced at $100 a bottle. It will be available primarily to the Black Hills wine club. Unfortunately, Graham and Tamara did not produce a single-varietal Cabernet Sauvignon in 2015. So far, just a handful of Okanagan producers have released wines in the $100 range. Fairview Cellars Iconoclast, which is a Cabernet Sauvignon, is $130. Mission Hill Oculus, a Bordeaux blend, is $135. Martin’s Lane Winery has $100 Pinot Noir while CheckMate, a sister winery, offers most of its Chardonnays at $100 and up. What makes the Black Hills Cabernet Sauvignon worth $100? For those whose budget is more limited, Black Hills also will release an excellent 2016 Chardonnay next spring at $30. Black Hills Chardonnay 2016 ($29.90). This elegant wine begins with aromas of citrus and apple, with a touch of butter and vanilla. The refreshingly bright fruit flavours are framed very subtly by the oak, in a flavour balance that is close to perfection. 92. Black Hills Cabernet Sauvignon 2014 ($100). This wine was doubled decanted and then half a bottle was set aside until next day, simulating how the wine might taste in another three to five years. The wine opened up wonderfully, starting with aromas of cassis and oak. On the palate, there were layers of flavour, starting with dark fruits and finishing with notes of cocoa and coffee. The fully ripe tannins gave the wine a rich and generous texture. 95. Ann Sperling’s jack-of-all-trades ability as a winemaker is remarkable. At Sperling Vineyards in East Kelowna, those skills are on display in wines running the gamut from sparkling to Icewine, with a natural wine to boot. I have recounted her story in numerous books. Here is an except from John Schreiner’s Okanagan Wine Tour Guide. The story began when Giovanni Casorso came from Italy in 1883 to work at Father Pandosy’s mission before striking out on his own (he was once the Okanagan’s largest tobacco grower). His sons planted several vineyards. Formerly known as Pioneer Ranch, the 18.2-hectare (45-acre) Sperling Vineyards was planted initially in 1931 with grapes and apples by Louis and Pete Casorso. When Pete retired in 1960, Bert Sperling, his son-in-law, switched to entire property to vines, both wine grapes and table grapes. The grapes here include a 50-year-old (in 2014) planting of Maréchal Foch, a 1976 planting of Riesling and a planting of indefinite age of Perle of Csaba, a Muscat variety once grown widely in the Okanagan. Recent plantings include Pinot Gris, Pinot Noir and Chardonnay. The Sperling wines, initially made at nearby wineries, came to market in 2009. Significant changes and portfolio additions have been made since then in a constant quest for more and more interesting wines. In September, 2017, Sperling Vineyards achieved organic certification. The winery, which also uses biodynamic practices in its vineyard, will be releasing organic wines next spring from the 2017 vintage. As well, Ann has begun making so-called natural wines, starting with the 2014 vintage. “We wanted to challenge ourselves while enhancing our food friendly line-up of estate wines,” she wrote in a note that accompanies the current releases. The reference is to Pinot Gris. The current releases include a Pinot Gris that was made by fermenting whole clusters and stems with wild yeast. The wine was fermented to complete dryness and was finished by settling, not by filtering. No sulphur was added. Sperling Market White 2016 ($19 for 450 cases). This is an aromatic blend of 33%Perle, 26% Vidal, 23% Pinot Blanc and 18% Bacchus. A touch of residual sugar lifts the fruity aromas and flavours and gives the wine more weight than one would expect from the modest 10.6% alcohol. The finish lingers and lingers. 89. Sperling Pinot Gris 2016 ($20 for 460 cases). The wine begins with aromas of melon mingled lightly with toast, suggesting that the wine may have been fermented, at least partially, in oak. It is rich on the palate with flavours of orange and melon, with a note of honey and oak on the dry finish. 90. Sperling Amber Pinot Gris 2016 ($30 for 150 cases). This is a “natural” wine, meaning that whole clusters of Pinot Gris were fermented with wild yeast, to total dryness. The orange-tinted wine is not filtered. It is cloudy in the bottle and will deposit a light sediment. The aroma includes notes of tobacco and marmalade. It has savoury as well as vegetative flavours. It is worth noting that this wine is not sulphured. A cautionary note: natural wines are an acquired taste. 90. Sperling Pinot Noir Rosé 2016 ($20 for 215 cases). This dry rosé presents in the glass with a lovely strawberry hue. The flavours are intense, with notes of raspberry and strawberry. 90. Sperling Market Red 2016 ($20 for 500 cases). A new wine for Sperling, it is an unorthodox blend of Pinot Noir and Maréchal Foch. The wine is aged partially in stainless steel and partially in neutral barrels. That preserves the herbal aromas and flavours of cherry and pomegranate. With just 12.1% alcohol, the wine is fresh and uncomplicated. 87. Sperling Late Harvest Riesling 2015 ($27.89 for 368 cases of 375 ml bottles). This wine has 134.8 grams of residual sugar balanced with 14.7 grams of acidity. Lightly golden in colour, the aromas present honey, lemon and ripe quince. The flavours are luscious, with notes of honey and fruit compote. A tangy acidity helps balance the sweetness. 91. Sperling Vidal Icewine 2015 ($55 for 190 cases of 375 ml bottles). This wine has 189.4 grams of residual sugar and 12.3 grams of natural acidity. This golden-hued wine begins with the classically intense aromas of ripe pineapple and orange marmalade, which are echoed in the rich and intense flavours. The sweet finish is persistent, staying many minutes in the mouth. 92. Sperling Brut Reserve 2011 ($55 for 200 six-pack cases). This elegantly packaged traditional method sparkling wine is 80% Pinot Noir and 20% Chardonnay. Five years on the lees before disgorging has produced fine bubbles and yeasty/brioche aromas. On the palate, there are flavours of pear and brioche. While the mousse gives the wine a creamy texture on the palate, the finish crisp and totally dry. 93. Back in the day, winemaking at Township 7 must have had its share of frustrations. The building simply was too small for all the work that had to be done there. When winemaker Mary McDermott arrived in 2014, a lot of the barrels and tanks were outside, next to the tasting room. Mary came from a senior job in Ontario where she made wine with Andrew Peller’s Trius winery. She joined Township 7 Vineyards not long after the winery came under new and somewhat reclusive ownership (but well resourced). One would assume she came after being assured that the new owners would put capital into the winery, which is just east of Penticton. They have delivered. The cooperage now indoors, and there is a lot more of it, including several French oak foudres and a range of stainless steel fermenters to support Township 7’s growing small lot portfolio. No doubt, Mary’s elegant winemaking is what has given the owners the confidence to expand the winery. Here are notes on current releases. Township 7 Riesling 2016 Fool’s Gold Vineyard ($24.97 for 658 cases). This is a vineyard on Tuc-El-Nuit Road in Oliver. Mary is impressed with the fruit because the site allows the grapes to develop flavours at moderate ripeness, while preserving acidity. The dry wine has aromas of lemon and lime, good weight on the palate, and flavours of lime with a hint of petrol. 90. Township 7 Reserve Sauvignon Blanc 2016 ($26.97 for 328 cases). The grapes are grown on the gravelly soils of the Blue Terrace Vineyard in Oliver, a long-time supplier to Township 7. The wine was fermented and aged in French oak barrels (15% new, 85% neutral). There is a hint of vanilla, passion fruit and gooseberry on the nose, leading to flavours of lemon and apple. The texture is rich but the bright acidity gives the wine a long, fresh finish. 91. Township 7 Gewürztraminer ($19.97 for 278 cases). This is made with Naramata Bench grapes fermented in stainless steel. It begins with aromas of lychee and rose petal spice, leading to flavours of lychee and grapefruit, with a hint of ginger on the finish. The wine is balanced to finish dry. 90. Township 7 Reserve Chardonnay 2016 ($26.97 for 438 cases). Grapes for this wine come from the Sundial Vineyard on Black Sage Road (now owned by Phantom Creek Estates). It was fermented in French and American oak barrels (30% new). It went through partial malolactic fermentation and, while aging in barrel, saw periodic lees stirring. It begins with aromas of citrus and butterscotch, leading to marmalade flavours. 90. Township 7 Pinot Noir 2016 ($30.97 for 548 cases). This is a ripe, full-bodied wine, with aromas and flavours of black cherry and plum, with a hint of vanilla on the finish. It has an appealing velvety texture. The grapes are from the Sperling Vineyard in Kelowna and the Remuda Vineyard in Okanagan Falls. The latter produces richer and denser fruit and that defines the robust character of this wine. 91. Township 7 Merlot 2015 ($22.97 for 1,068 cases). This is a blend of fruit from five vineyards; it also has eight percent Cabernet Sauvignon. It is a bold and ripe Merlot, reflecting the vintage. It has aromas and flavours of black cherry, black currant and plum with touches of tobacco and vanilla (the wine was aged 18 months in American and French oak). This is a very satisfying Merlot. 90. Township 7 Cabernet Sauvignon 2015 ($26.97 for 469 cases). There is 13.8% Merlot in this wine, which perhaps accounts for its accessible feel on the palate. Grapes for this outstanding wine come from the Blue Terrace and Sundial Vineyards. It begins with aromas of cassis and black cherry. On the palate, there are mouthfilling flavours of black currant, black cherry, plum, spice and vanilla. Aging the wine 18 months in French and American oak polished the long, ripe tannins. 93. Township 7 Cabernet Franc 2015 ($29.97 for 328 cases). This wine, with grapes from the Rock Pocket Vineyard near Oliver, was aged 24 months in French and American oak barrels. The wine begins with the brambly aromas so classic for this varietal. There is also a note of vanilla. On the palate, there are flavours of blackberry, black cherry and mocha with a touch of spice on the finish. 91. Township 7 Reserve 7 2014 ($32.97 for 738 cases). The winery’s flagship red, this is a blend of 68% Merlot, 16% Cabernet Sauvignon, 11% Cabernet Franc, 2% Malbec and 1% Petit Verdot. The majority of the fruit is from the Blue Terrace Vineyard. This wine begins with aromas of black cherry, cassis and mint. It delivers a rich medley of flavours, including black cherry, black currant, dark chocolate and cedar box. The wine has been aged 24 months in French and American oak. The tannins still have some grip. The wine should be decanted. It will also age well, peaking perhaps in 2024. 94. Seven years ago, winemaker Gavin Miller and his wife, Shana, with backing of a silent partner, took over the bankrupt Stonehill winery in Penticton. They renamed it Upper Bench Winery and Creamery – because it is located on Upper Bench Road and because Shana added an excellent cheese-making facility to the winery. The business has done so well that Gavin has no more room to increase production in the current winery. “We are stuck at 4,500 cases because my building won’t accommodate anything more, which is a bit of a shame because I wanted to go to at least 5,000 cases,” he told me recently. His options include removing vines adjacent to the current winery to make room for additional production and storage room. But like so many other winemakers with wineries of this size, Gavin has concluded that an incremental expansion is not cost effective. Justifying the investment in additional winemaking equipment and storage requires a move to 10,000 cases. Perhaps he could grow the revenues by inching up the prices of his wines. “I have also had people in here, saying my wine is too cheap,” he says. In our conversation, Gavin and I reflected on the trend among a growing number of wineries to price their wines aggressively, with surprisingly little consumer pushback. Indeed, expensive wines are often released just to members of winery wine clubs. Black Hills Estate Winery, as an example, has just released a $100 Cabernet Sauvignon primarily for its wine club. It appears that wine club members will pay up just to have exclusive wines. Gavin initially priced his wines at a time when consumers still were complaining that British Columbia wines are too expensive. Gavin wanted his wines to be affordable – and they are, delivering great value for the quality. My sense, however, is that Gavin will keep his feet on the ground and keep his wines affordable for the foreseeable future. Here are notes on his current releases at Upper Bench – all of them tasting clean and refreshing. Prices do not include taxes. Upper Bench Riesling 2016 ($20). This is a fresh, even delicate, Riesling, with aromas and flavours of lime, with hints of white peach. The excellent balance gives the wine a juicy finish. 90. Upper Bench Chardonnay 2016 ($22.53). This is a textbook example of a fresh, clean, fruit forward Chardonnay. It has peachy aromas. On the palate, the wine is juicy with notes of clove, peach and tropical flavours. The oak is exceptionally subtle, adding texture. 92. Upper Bench Pinot Noir 2015 ($24.25). The winemaker attributes the robust style of this Pinot Noir to his training with Bordeaux varietals. He like to make big wines. A full-bodied wine, it has aromas and flavours of cherry and raspberry with a hint of spice on the finish. 90. Upper Bench Cabernet Franc 2015 ($26.50). Gavin is one of the Okanagan winemakers advocating for a higher profile for this variety. This wine has the classic bramble and black cherry aromas and flavours. This is a bold, ripe, mouth-filling red. 91. Upper Bench Estate Merlot 2014 ($33). This is a wonderfully concentrated wine, with aromas and flavours of cassis and black cherry. The long ripe tannins make for a big, bold but accessible wine. 92. Upper Bench Estate Cabernet Sauvignon 2014 ($33). This is an elegant and polished wine, with cassis aromas and flavours of black currant, black cherry and a touch of chocolate. There are long ripe tannins, and absolutely no hint of greenness. The vines were cropped at 1.8 tons an acre. It may be barely viable economically but it does assure a delicious wine. 93. Fans of Hester Creek Estate Winery should always drink the occasional toast to Joe Busnardo. He is the Italian immigrant who, in 1968, first planted this superb piece of property on the Golden Mile south of Oliver. Not only did he identify great terroir when no one in the Okanagan had even heard of terroir; he planted vinifera grapes exclusively when the valley was full of hybrids. No winery would give him a premium for the vinifera grapes, so he let the grapes hang for the birds. Eventually, he opened Divino Estate Winery here. It was renamed Hester Creek after he sold the property in 1996, to move to Vancouver Island. It has been owned since 2004 by Prince George businessman Curt Garland, who also deserves a toast for the way that he and his team are realizing the potential of Joe’s terroir. A gleaming modern winery and tasting room replaced the rustic former Hester Creek winery. A suite of luxury villas on the hillside above the winery provide visitors with first-rate accommodation that has been lacking so long in Oliver, a community stuck until recently in a non-development time warp. One of Hester Creek’s advantages, aside from the soil and the exposure, are its blocks of mature vines (some dating from Busnardo’s plantings), which give winemaker Robert Summers outstanding fruit year after year. But to give Garland’s team credit as well, the viticultural practices of his crew are among the best in the Okanagan. There is also a technical reason for the appealing style of Hester Creek’s reds. Invariably, the wines have big ripe tannins that support tons of flavour without ever being “grippy.” The wines age well but that usually are drinkable right of the gate. The secret: this is the only winery in the Okanagan with Ganimede fermenters made by an Italian company of that name. These tanks capture the carbon dioxide gas generating by fermentation and, instead of venting it, recirculates it through the must. Bubbles of gas gently break up the cap of skins; the cap is also submerged all the time in the wine. This avoids extracting hard tannins. Hester Creek reds all have long, ripe tannins. Almost all of them have a generous texture, making for early drinkability for wines that still have the capability to age a reasonable time. The texture allows keen tasters to distinguish the Hester Creek style from other Okanagan reds. Hester Creek Character White 2016 ($17.95 for 3,000 cases). This is a blend of Pinot Gris, Gewürztraminer, Trebbiano, Pinot Blanc, Chardonnay and Sémillon. The wine begins with aromas of apples and peaches, with an accent of herbs. On the palate, it is a bowl of fruit flavours with a dry and lingering finish. 89. Hester Creek Terra Unica Riesling 2016 ($22.95 for 86 cases). The Terra Unica label is limited to the wine club. The wine begins with aromas of citrus and apples. It delivers a basket of fruit flavours, including lime, apples and peaches. With bright acidity, the wine is balanced to finish dry. The moderate alcohol (11.5%) keeps the wine light and refreshing. 91. Hester Creek Chardonnay 2016 ($24.95 for 467 cases). This wine was fermented and aged sur lies for eight months in French (75%) and American oak barrels. It begins with citrus aromas delicately mingled with hazelnut. On the palate, flavours of mandarin orange mingle with butter and lightly toasted oak. 91. Hester Creek Selected Barrels Merlot 2016 ($19.95 for 2,200 cases). The wine begins with jammy aromas of cassis and black cherry. Plump in texture, the wine delivers flavours of spicy cherry and black currant that lingers on the palate. 89. Hester Creek Selected Barrels Cabernet Merlot 2016 ($19.95 for 3,500 cases). This is a blend of Cabernet Franc, Cabernet Sauvignon and Merlot. It was aged six to eight months in French and American oak. This is an accessible, easy drinking red with aromas and flavours of cherries. 87. Hester Creek Character Red 2016 ($20.95 for 4,000 cases). This is a blend of Syrah, Italian Merlot, Petit Verdot and Malbec. The wine was aged six to eight months in French and American oak. Dark in colour, the wine begins with aromas of figs and black cherry mingled with a hint of pepper and vanilla. It is generous on the palate, with flavours of black cherry, plum, pepper and vanilla. It has the trademark soft, ripe tannins in the Hester Creek style. The wine is thoroughly delicious. 90. Hester Creek Syrah Viognier 2015 ($26.95 for 1,111 cases). The wine was aged 15 months in barrel (60% American, 40% French). The wine begins with almost perfumed aromas of cassis, cherry and vanilla. On the palate, there are flavours of black cherry, plum and fig with a hint of pepper on the finish. 90. Hester Creek Cabernet Franc Block 3 Reserve 2014 ($28.95 for 1,000 cases). This wine was aged 12 to 16 months in barrel (75% French, 25% American). Aromas of raspberry jam and red currants spring from the glass. The vivid flavours of cherries and blackberries are intense. It finishes with spicy red berries that persist. The tannins are firm but not hard. 93. Hester Creek Merlot Block 2 Reserve 2015 ($28.95 for 556 cases). This wine was aged 16 months in barrel (75% French, 25% American). Dark in colour, the powerful wine has aromas of black cherry and cassis mingled with vanilla. The flavours of cherry, plum and mocha are intense and the texture is concentrated, with long ripe tannins. 93. Hester Creek Terra Unica Petit Verdot Malbec 2015 ($32.95 for 88 cases). This blend of 85% Petit Verdot and 15% Malbec was also made just for the wine club. The grapes were co-fermented in the Ganimede tanks. Densely dark in colour, the wine begins with aromas of plum and black cherry mingled with notes of oak. The wine has a distinctly brooding mineral backbone with the taste of slate supporting flavours of black olives, figs, plums and dark chocolate. Because of its slightly grippy tannins, the wine benefits from decanting. 93. Hester Creek The Judge 2014 ($45) This is the winery’s flagship red, a blend of Merlot, Cabernet Sauvignon and Cabernet Franc. It begins with aromas of black cherry, mulberry and vanilla mingled with toasty oak. On the palate, a compote of black cherry and blackberry fill the mouth. The long, ripe tannins give the wine early accessibility while supporting five to seven years of further aging. 94. Hester Creek Late Harvest Pinot Blanc 2016 ($18.95 for 450 cases at 200 ml). The grapes are from 49-year-old vines. The wine’s honeyed aromas of apricot and ripe apple are enticing and echoed in the flavours. The wine’s 67.3 grams of residual sugar are so well balanced by the acidity (7.15 grams) that the finish is clean and refreshing. A delicious dessert wine that lingers and lingers. 91. Almost since its first vintage in 1991, Blue Mountain Vineyards & Cellars has had a strong following for its wines. There was a time when customers needed to get on the winery’s mailing list. When the postcard arrived, announcing a new release, he who hesitated missed out because the wine sold out so quickly. I once was in charge of securing wine for a couple of family weddings. The winery did me the favour of supplying the wines. In both instances, this created something of a sensation among the guests who appreciated good wine. It gave me a lot of satisfaction that the guests were not being served plonk. It has become easier these days to get Blue Mountain wine. You need not ask for a favour or two. The Okanagan Falls tasting room is open from spring through fall. The wines shows up in wine stores. There still is a strong demand for Blue Mountain’s wines but there also are about 300 wineries in British Columbia. In the early 90s, there were perhaps 20 or 30 wineries in British Columbia. There is a lot more wine to choose from these days. Even so, Blue Mountain remains at the top of its game. It makes all of its wines from the 38-hectare estate vineyard. It could increase production by buying and planting more vineyard in the Okanagan Falls region if there were some adjacent to the estate. That is not likely to happen. There are few wineries as tightly focussed as Blue Mountain. The Mavety family decided that their Okanagan Falls property enjoyed conditions comparable to Burgundy; consequently, Burgundian grape varieties dominate the vineyard. The winery produces two red varietals, Pinot Noir and Gamay Noir, and three whites, Chardonnay, Pinot Gris and Sauvignon Blanc. The latter two are nods to Alsace and Sancerre. The winery makes both still table wines and sparkling wines, in two tiers – regular and reserve. This blog looks at two excellent “regular” table wines released earlier this fall as well as the winery’s three reserve tier sparkling wines. The sparkling wines are all made in the traditional method of Champagne. The base wines are fermented to dryness, blended where appropriate, and then put in heavy bottles for the secondary fermentation that produces fine and long-lasting bubbles. Blue Mountain is especially disciplined when it comes to making bubble. Gold Label Brut, its “regular” sparkling wine, ages about two years on the yeast lees before the wine is disgorged. This enhances the body of the wine and develops the classic brioche aromas and flavours. The reserves remain on the yeast lees for five or six years (36 months in the case of the Rosé). The extra time on lees develops more intensity and more complexity, putting the wine on the same quality level as Champagne – without costing as much. In early 199os, when Blue Mountain began making bubble, there were just three other BC wineries making sparkling wine. Today, I would estimate that at least 100 wineries have released bubbly, or are working on it, in every style from carbonated to traditional method. Even with that much competition, Blue Mountain is still one of the leading producers of bubble. 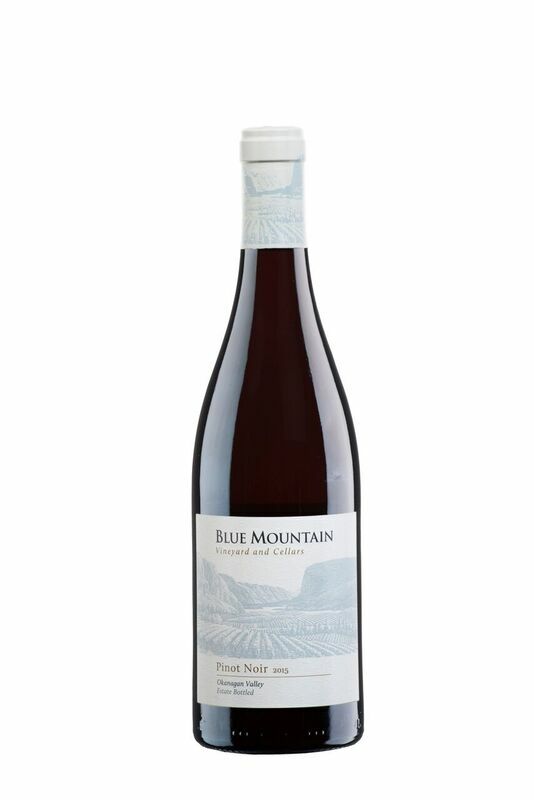 Blue Mountain Pinot Gris 2016 ($21). This complex white wine is made with fruit from 30-year-old vines. Forty percent was fermented and aged for eight months in French oak (new and used). The remainder was fermented and aged in stainless steel. The two lots were blended in June 2017. The result is an elegant and complex white, with aromas and flavours of citrus, pear and apple. It is crisp and dry, with a hint of anise on the finish. 90. Blue Mountain Pinot Noir 2015 ($30). This wine, made with six clones of Pinot Noir from mature vines, has been aged 16 months in French oak (ranging from new barrels to three-year-old barrels). The wine begins with aromas of cherry and toasty oak. On the generous palate, there are flavours of cherry, cassis, vanilla and toasty oak, with spicy notes on the finish. The richness of flavour reflects the hot 2015 vintage but the moderate alcohol, just 12.5%, tells us that the Mavety family took pains to pick early to retain freshness and acidity. 90. 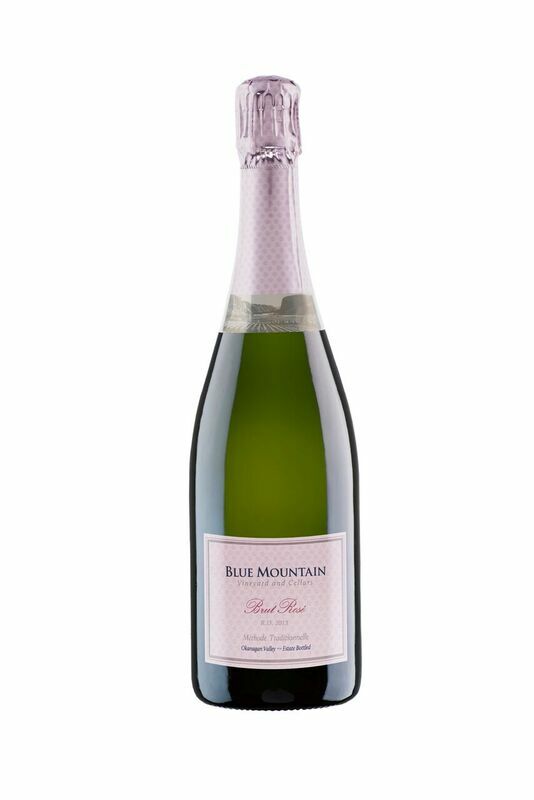 Blue Mountain Brut Rosé 2013 R.D. ($33). This is 65% Pinot Noir and 35% Chardonnay. The wine presents in the glass with a rose petal hue and with fine bubbles. Those bubbles propel aromas of strawberry and flavours of raspberry. Crisply dry on the finish, this would be an excellent wine for brunch. 91. 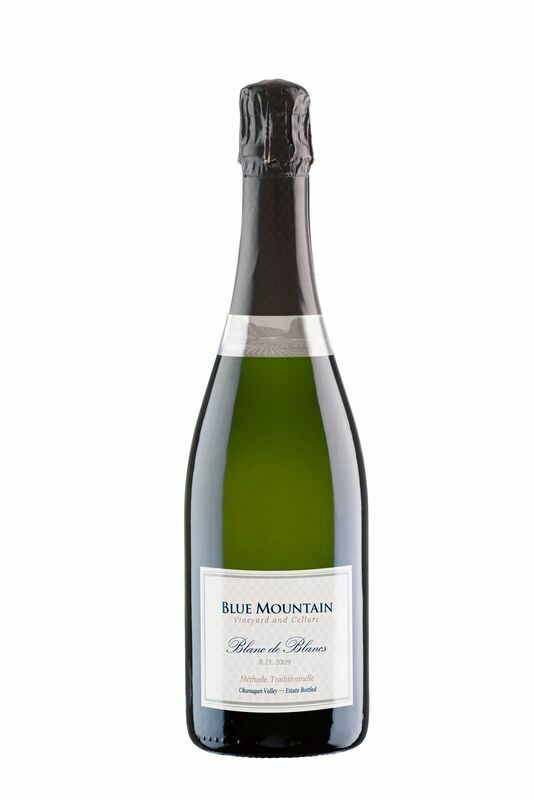 Blue Mountain Blanc de Blancs 2009 R.D. ($39.90). This wine was disgorged in in August 2016 and spent a little more than a year aging in bottle before release this fall. Made in the traditional Champagne method from Chardonnay, this is easily a match for Champagne. Crisp and dry, the wine has a lively mousse that delivers brioche and citrus aromas. On the palate, there are hints of green apple mingled with a nutty, toasty finish. 92. 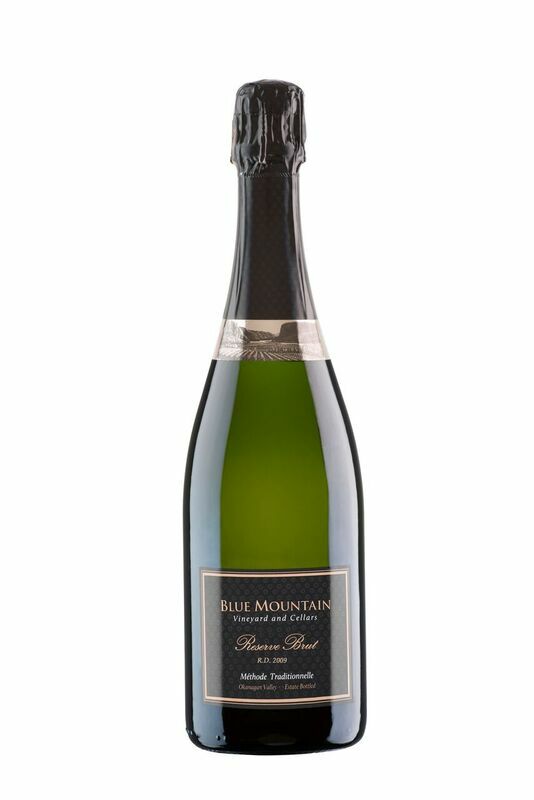 Blue Mountain Reserve Brut 2009 R.D. ($39.90). This elegant wine is 55% Chardonnay and 45% Pinot Noir, a classic Champagne blend. The wine was aged on the lees for six and a half years, was disgorged in August 16, and aged more than a year in bottle before release. The wine, which has a fine mousse, begins with aromas of brioche and apple which are echoed in the flavours, along with a hint of strawberry. Time on the lees has given this wine an appealing rich and creamy texture. 93. A deliberate spirit of Bordeaux winemaking influences the approach to winemaking at Clos du Soleil Wines in the Similkameen. There is a strong emphasis on making wines that express the terroir. While the winery purchased fruit from the Okanagan in its early days, that was just a strategy to carry on the business until the estate vineyard was in production. Now, the winery works exclusively with Similkameen fruit, either from its own vines or from nearby vineyards that it manages. “At Clos du Soleil we are committed to producing wines from the very best vineyard locations in the Similkameen Valley that best demonstrate the unique terroir of our valley,” says Michael Clark, the winery’s managing director and winemaker. In June, Clos du Soleil purchased an additional 10-acre parcel on Upper Bench Road, near its current 10-acre estate vineyard. In the French spirit, this block is being called “Les Collines” which is French for hills. “The land is hilly terrain comprised of several steep ridges which is ideal terroir for growing Sauvignon Blanc and Semillon grapes that will be used to produce Clos du Soleil's white wines such as their flagship white Capella and the Estate Reserve White,” the winery said in its announcement. Initial plans call for planting half of the block in 2018. The site is already certified for organic production. Michael plans to go further, introducing biodynamic practices here. Here are notes on three sophisticated red released by Clos du Soleil this fall. Clos du Soleil Growers Series Syrah 2015 ($33.90 for eight barrels). The grapes for this wine are from Middle Bench Vineyard. This delicious wine delivers a big mouthful of sweet fruit – black cherry and plum accented with notes of vanilla and mocha. There is a hint of white pepper on the nose and on the finish. 90. Clos du Soleil Signature 2014 ($44.90 for 29 barrels). This is a blend of 38% Cabernet Sauvignon, 37% Merlot, 14% Petit Verdot, 8% Cabernet Franc and 3% Malbec. This wine begins with aromas of mint, cassis and vanilla, leading to flavours black cherry, black currant, plum, vanilla and chocolate. Decanting is recommended to allow this wine to express its power. 94. Clos du Soleil Estate Reserve Red 2013 ($59.90 for eight barrels). This is a blend of 50% Cabernet Sauvignon, 37% Merlot, 8% Cabernet Franc, 4% Petit Verdot and 1% Malbec. The wine was aged 17 months in French oak barrels. This has the elegance and power for a Grand Cru from Bordeaux. The wine begins with aromas of cassis, blackberry and blueberry. On the palate, it delivers flavours of black currant. On the finish, notes of leather and black olives mingle with spice. Decanting is also recommended for this wine, which was bottled unfined and unfiltered. 94. Moon Curser Vineyards co-founder and winemaker Chris Tolley seems to have a bit of a nightmare: that he could be making wine in Beaujolais with just one varietal. “I would do horrible in Beaujolais,” he says. “The idea of knowing just one grape for my whole life ….” He lets that frightening [to him] thought hang in the air. Life is different at Moon Curser. He works with numerous varietals, almost all estate grown and some fairly obscure in the Okanagan. These include Arneis, Tannat, Touriga Nacional, Dolcetto, Carménère, Tempranillo, Marsanne and Roussanne. There is not much chance of getting jaded as a winemaker with that array of grapes every harvest. In late summer, I had a leisurely tasting with Chris. Because I got sidetracked by other commitments, to say nothing of a month in Spain, it has taken me some time to write up the notes. Many of these wines are now sold out at the winery. However, both the wines and his comments were so interesting that I am offering my notes all the same. Moon Curser Arneis 2016 ($22.52 for 269 cases). The winery has an acre and a quarter of this variety from northern Italy. In 2016, Chris picked the grapes at a slightly lower ripeness than in previous years to produce a crisper white, more in the northern Italian style. The aromas are floral, with notes of melon and citrus. It has flavours of melon and green apple, finishing with a crisp, refreshing character. 91. Moon Curser Afraid of the Dark 2016 ($19.04 for 577 cases). The blend is 45% Viognier, 40% Roussanne and 15% Marsanne. The grapes are fermented separately and blended later, to be aged in stainless steel. This is one of Chris’s favourite wines; he is perplexed that it is a perennial silver medal winner but rarely a gold medal winner. I would suggest that competition judges are fickle, or just not exposed to enough Rhone white blends. This is a luscious and fleshy white with aromas and flavours of apricot and nectarines. 91. Moon Curser Dolcetto 2016 ($23.39 for 407 cases). This Italian variety, widely grown in Piedmont, was planted by Moon Curser in 2013. This wine was from the first full crop. It is an opulent, ripe, unoaked red, with aromas of cherry and strawberry. On the palate, the cherry and strawberry notes are joining with flavours of black currant jam. In short, a delicious fruit bomb. 92. Moon Curser Carménère 2015 ($ for 297 cases). This varietal is so popular in the Moon Curser portfolio that Chris has mused about converting his entire vineyard to Carménère. The grape almost went extinct in its native Bordeaux. After phylloxera devastated the vineyards, it was not replanted, perhaps because it ripens late. The reputation was re-established in Chile. There are at least three producers in the Okanagan. The wine begins with aromas of black currant jam and pepper. Generous in texture and weight, it has flavours of black cherry, pomegranates and vanilla, punctuated by a peppery note on the finish. 92. The succession of warm to hot vintages in the Okanagan since 2012 enabled Chris to make a powerful Carménère year after year. Moon Curser Syrah 2014 ($23.39 for 1,008 cases). Chris believes this wine, reflected a very good vintage, was the best Syrah he had made. It is an elegant and concentrated red, with aromas of black cherry, spice and pepper. On the palate, the dark fruit flavours are meaty and earthy. 92. Moon Curser Syrah 2015 ($23.39 for 1,188 cases). This is a bold and juicy wine, with aromas of black cherry, pepper and mocha. On the palate, there are flavours of black cherry, fig and licorice punctuated with subtle notes of pepper. 91. “2014 is probably the finest Syrah we have ever done,” Chris says. “It was a great year. 2015 was not a bad follow up.” The only issue with 2015 was that smoke from forest fires created a risk of smoke taint. Alive to that danger, Chris pressed the Syrah from the skins at the end of fermentation rather than giving it a long maceration. The wine is marginally lighter than 2014 but the flavours are correct. Moon Curser Border Vines 2014 ($23.39 for 1,021 cases). The blend is 40% Cabernet Sauvignon, 20% each of Malbec and Carménère, 14% Merlot and 6% Petit Verdot. This is a harmonious, well-integrated blend with aromas of cassis and vanilla, leading to flavours of black currant and black cherry. There is a touch of spice and leather on the finish. 92. Moon Curser Border Vines 2015 ($23.39 for 888 cases). The blend here is 50% Cabernet Sauvignon, 39% Malbec and 11% Carménère. In former times, this wine was called Six Vines because it was a blend of six Bordeaux varietals. It now focuses on just three varietals, in part because Chris had no Merlot available in the 2015 vintage. However, the wine tastes as good as ever. It begins with aromas of blueberries, black currants and mint. It is somewhat lighter in body than the 2014 because, to avoid smoke taint, Chris did not macerate the Cabernet Sauvignon on the skins after fermentation. The wine is still rich with flavours of black currant and black cherry and absolutely no hint of smoke. 91. Moon Curser grows no Merlot. When Chris was developing the estate vineyards, he chose to plant varietals that almost no one else grows. Merlot? Well, it is the most widely planted red in the Okanagan. The supply once seemed inexhaustible. In the last few vintages, the demand for wine grapes has more than caught up with the supply and it has become difficult to get Merlot. Moon Curser Cabernet Sauvignon 2014 ($37.30 for 243 cases.) This densely structured wine – a classic age-worthy Cabernet – begins with aromas of cassis and blackberry. On the palate, there are flavours of black cherry and black currant, along with black olives, leather and dark chocolate. 92-93. Moon Curser Tannat 2013 ($37.30 for 100 cases). The Tannat grape, whose historic home is southwest France, is the primary red in Uruguay and is being planted in a number of other wine growing areas. Moon Curser describes it as “a robust and intense grape variety.” This is a dark, concentrated wine with aromas of plum and vanilla. On the palate, the dark fruit flavours (figs, raisins) are something of a liquid fruit cake. 93. “I really like the Tannat,” Chris says. “I could see doing a lot of Tannat but you would need a big maturation program. I could not see releasing it really young.” He described the 2016 Tannat, still maturing in barrel, as “grippy” because the tannins have not yet matured. Moon Curser Dead of Night 2014 ($37.30 for 364 cases). This is a blend of 50% Syrah and 50% Tannat. This full-bodied wine has aromas and flavours of black cherry, vanilla and plum, with a hint of pepper on the finish. 94. Moon Curser Dead of Night 2015 ($37.30). This is a blend of 50% Syrah and 50% Tannat. Dark and almost jammy on the palate, this wine reflects a big, ripe vintage. It has aromas and flavours of dark fruit, including figs. The rich flavours linger a long time on the palate. 94.